Built in the 1800s for a Dutch merchant and his wife, Villa 42 Lighthouse Street now serves as a holiday home for vacation makers in historic Galle. 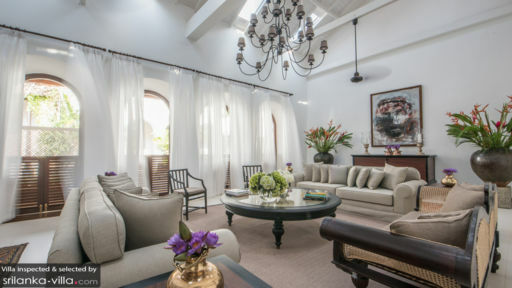 This gorgeous colonial villa occupies a prime location, putting guests within walking distance to each and every attraction situated within Galle Fort. Four finely-appointed double rooms offer ample space for eight guests. Furnished with luscious rugs, pillowy beds, antique pieces and modern amenities, the rooms are pleasing to the eye, and offer a tranquil environment ideal for facilitating a night of deep slumber. The entrance of Villa 42 Lighthouse Street is a charming sight made up of a cosy porch, arched doorways and an intricate lamp hanging from the soaring ceiling. A pretty little garden, bedecked with tropical foliage, lies within the compounds. Elegant pieces and sleek touches adorn the interiors of this beautifully-restored villa. Creamy, light hues painting the walls create a soothing sight, and complementing the elaborate paintings and intricate lighting perfectly. You will also fall in love with the dark wood finishings and antique furniture in some of the rooms. The capacious living areas offer a deeply comforting spot perfect for relaxation and rejuvenation, particularly after a day of sightseeing outside of the Fort. In the early hours of the evening, make your way to the bijou roof terrace. 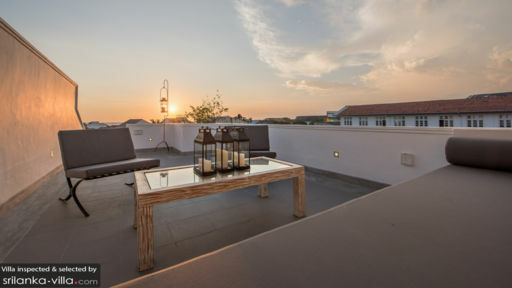 This is the perfect spot to wind down with a glass of wine or a round of sundowners, as you set sight on romantic sunset views over the skyline. 42 Lighthouse Street is a full service property with housekeeping service, guest services and a daily breakfast service. Laundry service and airport transfers are available at additional cost. 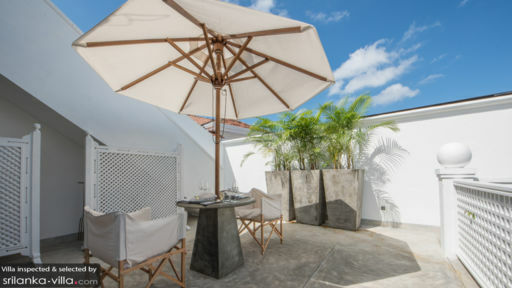 Villa 42 Lighthouse Street sits in the heart of historic Galle Fort, putting travellers within close proximity to the alluring sights and sounds of this well-known UNESCO Heritage Site. Travellers keen on venturing out will find a variety of charming boutique shops and restaurants. Be sure to take an exploratory stroll along the Fort walls. Do not miss the magical hour of sunset, for it promises to provide a breathtaking sight. Attractions such as the Dutch Reformed Church and Martin Wickramasinghe Folk Museum Complex are must-see spots for cultural buffs.